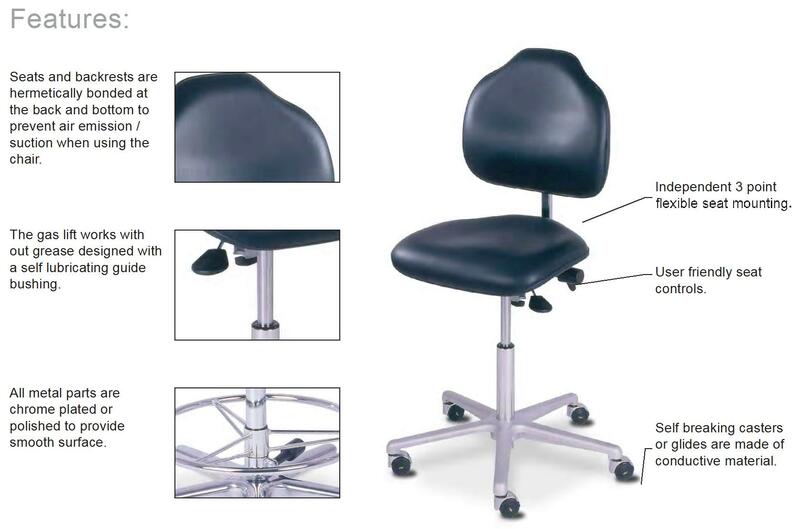 "The Milagon designed, Class 10 approved, clean room chair is your solution to Clean Room/ESD requirements. In addition to ergonomic and safety requirements, Stera WORKSEATS® responds to stringent specifications placed on clean room furniture as required in the electronic or medical fields without sacrificing comfort. Conductivity is within the specified range of 105Ohm. Milagon's chairs are tough enough to take the harsh environments found in the workplace today. All metal parts are chrome plated. The gas lift works without grease. Available with conductive slef braking casters or conductive glides. SEats and backrests are hermetically bonded at ht eback and bottom. Independent seat tilt and backrest adjustments. The WS1710 is an ESD low profile clean room seating system which features a dark charcoal vinyl seat and backrest assembly. Mounted on a polished Star Base with conductive glides. The height adjusts 17" to 24". Please contact Indoff for further information on this and other Milagon seating systems. Adjustable Height: 17" to 24"